Everybody knows that it becomes warm by solar light. English astronomical scholar, Herschel discovered that there is the part that can warm the things in the solar light. 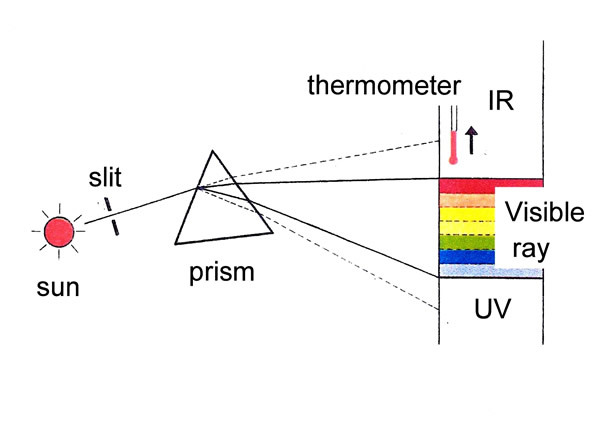 In 1800, when Herschel experimented that solar light shoots to the prism, he discovered the existent of invisible infrared rays by raising the indicated value of the thermometer which is placed outside of red in 7 colors visible light. The invisible light with the power to warm the things was named “infrared rays”, because they exist outside of red in visible light as shown in Fig.1.The infrared rays are the kind of electromagnetic waves, as well X ray, UV, visible light, microwave and radio waves. The electromagnetic waves have the name depending wavelength shown in Fig.2. They also have the characteristics depending wavelength. The Infrared rays are divided into two wavelength regions, “near infrared rays” and "far infrared rays". The electromagnetic waves with the wavelength from 3μm (micron) to 1mm (millimeter) = 1,000 microns are defined as the far infrared rays by JIRA (Japan Far Infrared Rays Association). It is the reason that the electromagnetic waves more than 3μm in wavelength just match the molecule vibrations forming articles surrounding us such as stones, woods, plastics, fibers, waters, foods and animals including a human being. （３）What are the far infrared radiation to? All materials more than absolute zero (-273 degrees Celsius) radiate energy of the far infrared region, the higher the temperature, the higher radiation dose (energy) is a lot. It came to be known that the amount of radiation is affected by a material and the surface condition in the case of same temperature. In various kinds of materials, ceramics radiate a lot of far infrared rays. The radiation of the far infrared rays is low in metal, however metal reflects it well. Metals are used as a reflector with high reflectance. 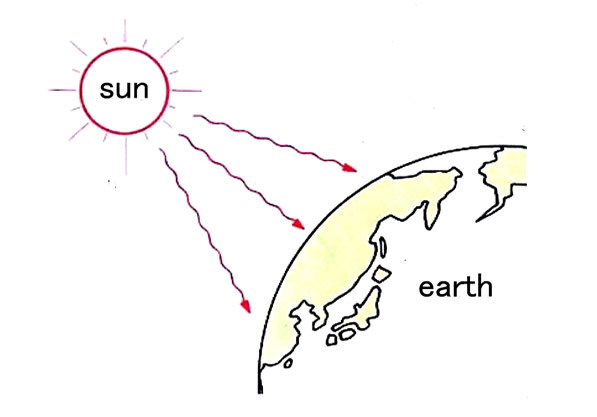 In general, the heat moves from the one where the temperature is high to low one by radiation. The far infrared rays emitted from ceramics heaters go straight on in space and shoots the material surface with the speed (about 300,000 km/ second = the speed to make 7.5 laps earth between 1 second) same as light. Frequencies (velocity of light ÷ wavelength) of far infrared rays just match the vibrations of molecules forming water, woods, plastics, fibers, paints, foods and animals including human being. These materials absorb irradiated far infrared rays and a temperature rise occurs by doing molecule vibration lively. This effect becomes remarkable when the natural frequencies of the material and the frequencies of irradiated rays are harmonized. It is the reason that far infrared rays is widely used in the field of heating and drying. As the natural frequencies of the material do not match the irradiated electromagnetic waves, the effect to warm the things is less. （５）Will the far infrared rays infiltrate the body of the person deeply? Will the far infrared rays penetrate glass? An advertisement of a heater written by the phrase that the far infrared rays becomes warm from a core of a body for deep infiltration, is an error. As shown in Fig.4, the energy of the far infrared rays is almost absorbed in about 200μm depth by the skin surface and changes to heat. The heat comes by blood efficiently to the inside (a core) of the body and warms the body. 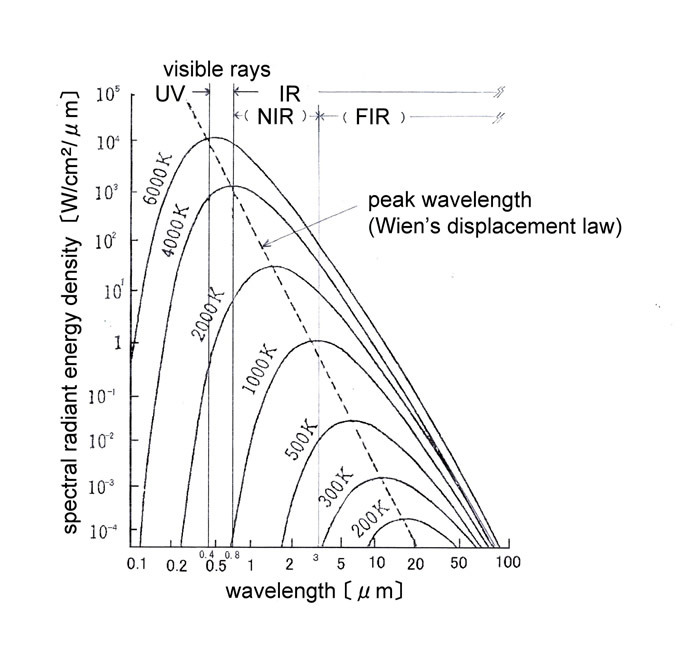 As shown in Fig.4, the near infrared rays seep from the skin surface to depth of several millimeters. Using this characteristics, methods to certify an individual by examining the vein pattern of a finger or a palm using near infrared rays are recently introduced in several banks. Plastics, plants and minerals (stones, glasses, ceramics and so on) absorb far infrared rays well, and the far infrared rays taken in turns into almost heat at surface, and it is not to transmit. It is apt to seem that the far infrared rays penetrate into the glasses because a visible light transmits. However it is a mistake. Water and alcohol absorb far infrared rays well. 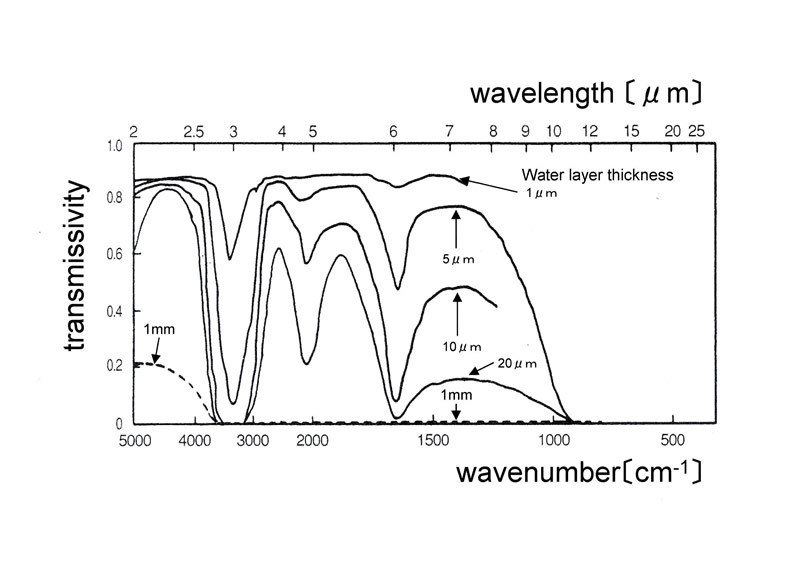 As shown in Fig.5, far infrared rays are almost absorbed if the water layer thickness is more than 1mm, they do not penetrate the water layer. The metal which the surface glittered (not oxidized) reflects back far infrared rays well. The reason why a metal plate is installed back of the heater in the far infrared heating equipment is that centralize far infrared rays in the front as much as possible. International Journal of Thermophys., vol.7, pp.1101-1113, 1986. It is important that you must know the physical meaning of "emissivity" to understand far infrared rays. Emissivity is defined as the ratio of energy radiated from the material surface of a certain temperature and a black body (the virtual object which completely absorbs radiated energy) of the same temperature. Emissivity is different by the material, and its surface conditions (for example, roughness). In addition, it is depends on the wavelength. The emissivity measurement method of the heater was fixed with main contribution by JIRA (Japan Far Infrared Rays Association) as JIS R 1801 which wrote "a measurement method by FTIR for the emissivity of ceramics which are used as radiated material of infrared heaters”. (Note) FTIR is Fourier transform infrared spectrophotometer. 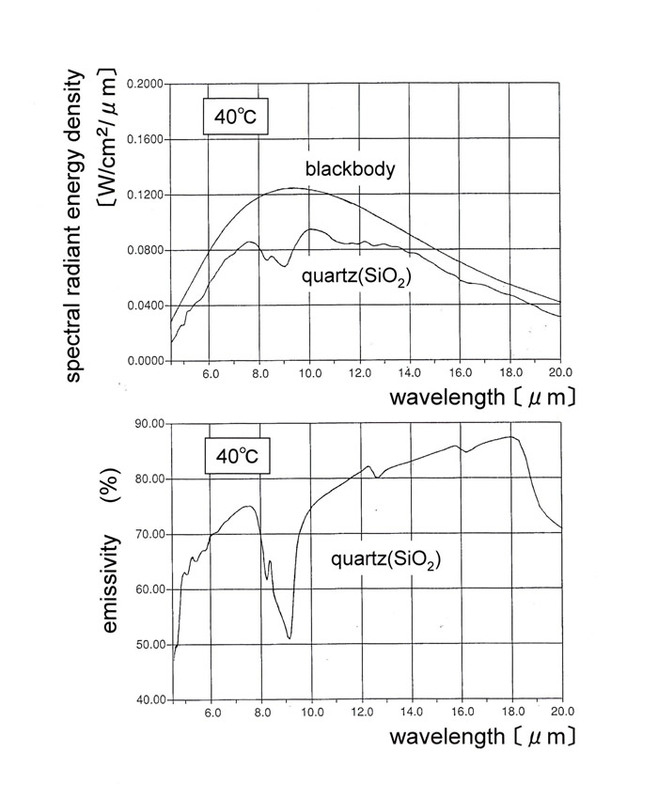 The figure of radiated energy density and that of the spectrum emissivity of quartz are shown in Fig.6, and the spectrum emissivity data of two kinds of marketed far infrared heaters are also shown in Fig.7. 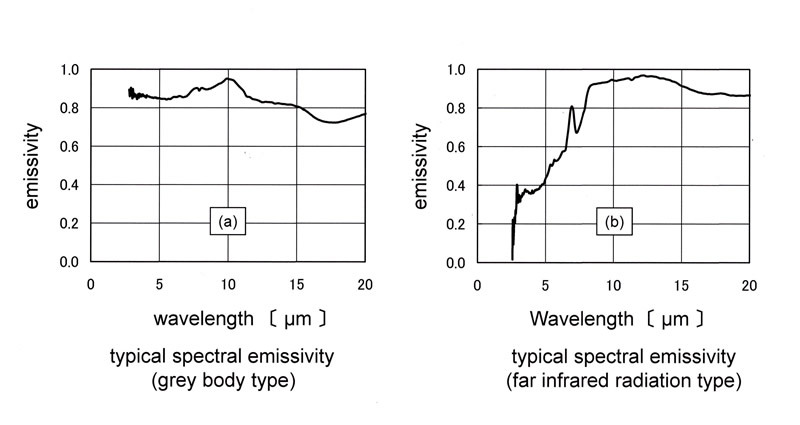 Fig.7(a) shows an example of the heater which emissivity is high for the whole far infrared region, Fig.7(b) shows that its emissivity is low for short wavelength region. It is not good that spectrum emissivity should be high in all wavelengths region. Generally speaking, a heater with the emissivity characteristics equal to the absorption characteristics of the heating object is desirable. The heat comes from the high temperature to the low one. This is a principle. There are three methods (conduction, convection and radiation) in way of heat transfer. The heat transfer is actually performed in the form with the combined ratio of these three methods. Heat gradually comes when one end of the iron bar is heated and becomes hot to the end. It is called conduction heat transfer that heat is transmitted through the material in this way. Thermal conductivities are different by a material. Metal is a good conductor of the heat. The gas is generally a low heat conduction body. Therefore, heat conduction becomes lower in the material with many apertures. When liquid and gas such as water and air are heated from the bottom, the warmed part rises because its density lightens by expanding. On the other hand, the cold upper part drops. These actions are performed repeatedly, and total temperature rises. In this way, the heat transfer method by moving liquid and gas is called convection. Heat transfer methods that do not need a medium, are called radiation heat transfer, as solar heat directly arrives at the earth and warms the ground. The heat is directly absorbed to a material in the form of electromagnetic waves and the temperature of the material raises. (activate the vibration of the atom that forms a material) Heat transfer by the far infrared rays is radiation heat transfer itself. 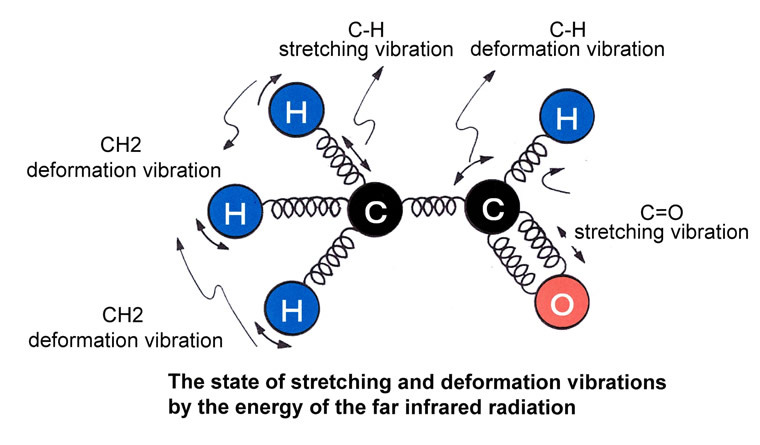 When there is gas as an intermediate medium, in the case of nitrogen (N2) and the oxygen (O2), the far infrared rays is not absorbed, however it is absorbed in the case of gas with the polarity such as carbon dioxide (CO2) and water vapor (H2O). The material emits the energy according to the temperature in the form of the electromagnetic waves. The relationship between the radiated power and the wavelength depends on the temperature of the material and is shown in Fig.9. These relationships are called Planck’s law. Fig.9 shows the case of a black body (emissivity is 1). The emissivity depends on the kind of a material and its surface condition. The emissivity of a material is less than 1. The emissivity curve of a material is shifted from one of a black body. A material with the same temperature as a black body has a spectrum curve of radiated energy located below the curve of a black body. As the temperature of the material becomes higher, the amount of radiated energy from a material becomes larger (refer Fig.9 of Planck’s law). The amount of energy (E) emitted by a black body of kelvin K is in proportion to the biquadrates of the absolute temperature (T). It is Stefan Boltzmann law. λ＝2897／Ｔ[μｍ]This is called Wien´s displacement law. For example, the peak wavelength (λ) of a person with the temperature of 36 degrees Celsius (absolute temperature T = 36 + 273 = 309K) becomes 2,897/309=9.4μm. The person emits the far infrared rays with about 9.4μm as a peak. About peak wavelength shown in Wien´s displacement law, what you should pay attention to is as follows: An integrated area of the short wavelength side holds 25% of all energy, the long wavelength side holds 75%. The long wavelength side (the far infrared side) emits energy of 3 times of the short wavelength side. Then, the wavelength (λ) to divide the radiated energy of the black body of absolute temperature T (K) into two is given as follows: λ=4,108/ T [μm]. For example, at wavelength 3μm of the border of near infrared and the far infrared regions, the black body temperature T divided into by 50% of radiated energy becomes =1,096 degrees Celsius T =4,108/3=1,369 (K) (=1,369-273). It was shown that a lot of far infrared radiated energy is considerably included in the object of the high temperature. 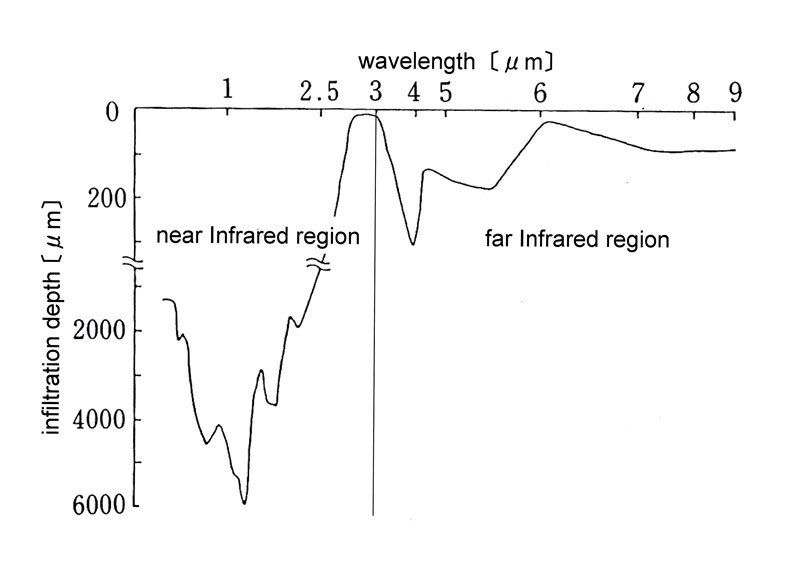 The peak wavelength is of course in near infrared region at 2,898/1,369=2.1μm. On the other hand, in the case of the hot wind heating, heat flux flows in proportion to a difference of hot wind temperature and the surface temperature of the thing. In this case, the surface temperature of the thing nears hot wind temperature immediately, the difference of both temperatures disappears, and the heat flux falls. Therefore, the heat flux is not readily in the thing. 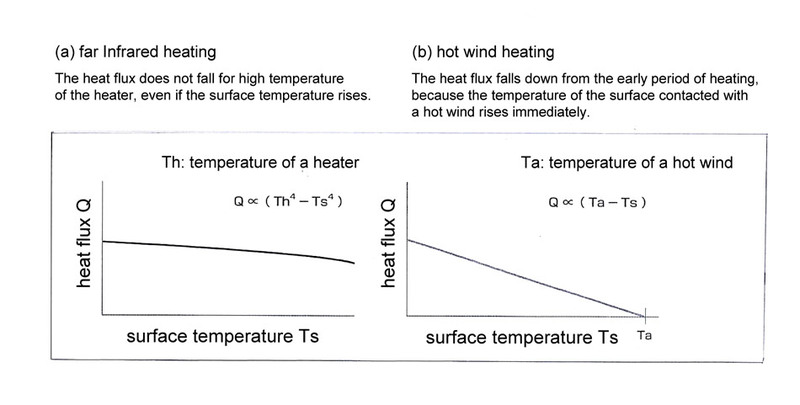 (refer Fig.10(b)) The evil that the surface of the thing is burnt appears in giving hot wind temperature forcibly for high heating efficiency. This is the same about the heating (conduction) by the heat board. Fiber is the matter that the absorption and the characteristics of the re-radiation of the far infrared rays are high in personal materials. "The far infrared processed fiber" is the fiber which improved heat retention by raising absorption and re-radiation characteristics in wider far infrared regions than original through kneading the materials such as the ceramics into the chemical fiber, or through coating them on the outside of the natural fiber. In comparison of the far infrared processed fiber and the non-processed fiber with same quality, absorption and the re-radiation characteristics of the far infrared processed fiber improves　obviously, therefore, the heat retention of the far infrared processed fiber becomes higher than that of the non-processed fiber. 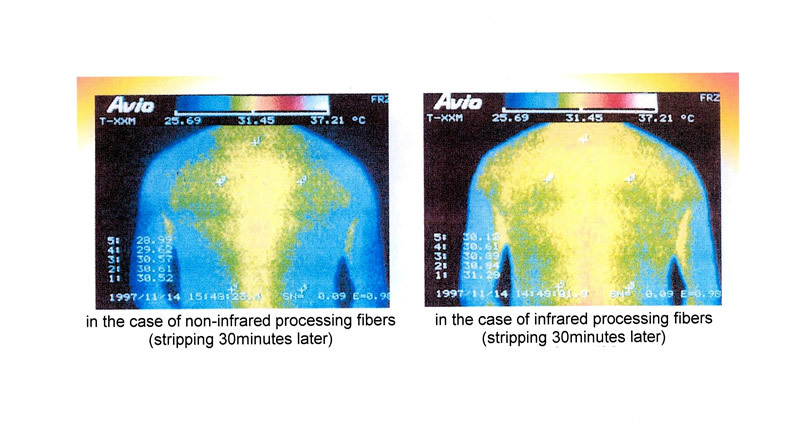 Above mentioned results are confirmed by skin thermometry shown in Fig.11.Fig.11 shows that skin temperatures in case of the underwear using far infrared processed fiber is higher and its area is wider. Many materials in our personal belongings except metal (plastics, paints, textiles, wood, rubber, food and so on) absorb the electromagnetic wave from 2.5 μ m to 30 μm in wavelength (mainly in the far infrared region) well. The far infrared rays with above wavelength are mainly generated from heated ceramics. It is the reason that the far infrared ceramics heater is widely used as a heat source of heating and drying in industrial and commercial fields. The oxygen and nitrogen in air do not absorb far infrared rays, however, carbon dioxide (CO2) and water vapor (H2O) absorb far infrared rays well.